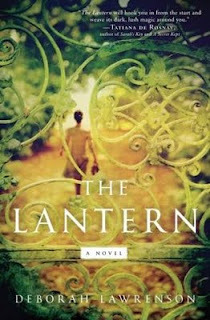 I fell into hot, heavy, passionate love with Deborah Lawrenson's novel The Lantern. So it's with great delight that I get to share my interview with her. Learn more about her writing, The Lantern, and what she's enjoying these days. Comment for a chance to win this novel -- you'll love it! My first novel was based on my experiences working in London for Nigel Dempster, the most famous national newspaper gossip columnist of his day. It was a great job for a young journalist, meeting everyone from film stars to lords and ladies. In my fevered mind, my book was a cross between Armistead Maupin’s Tales of the City and Evelyn Waugh’s Vile Bodies, with lots of topical and rather silly interweaving plots. Needless to say, the publishers didn’t see it quite that way. For them, it was a piece of chick-lit they could market as an insider’s view of the gossip world – and so they did. Thanks to my training as a journalist I am a very practical writer, wed to my routine to the point of dullness. I treat writing the first draft of a novel as an office job: I sit down at my desk every day and work for as much of the day as I can. When the first draft is done, I relax and enjoy playing around with the words and structure. Was The Lantern the original title of your book? I had two prospective titles to suggest to my literary agent: Lost in Provence and The Lantern on the Path. When it came to emailing them to her, I decided that The Lantern on its own was better, and that’s the one she liked. After the book was sold to the US publishers, we all spent a great deal of time trying to think of a better title. Night Lavender was one contender; The Scent of Night was another. There were several attempts to get House in the title. In the end, we stuck with the original – and I was delighted as that had always been my first choice. As you were writing The Lantern, was there a particular scene or character that surprised you? I have to say I was surprised how evil Pierre became. I wasn’t quite sure where his character was going when I wrote the first scenes of his visitations to Bénédicte, but did I see that coming when I first began to pin him down on the page? I don’t know – perhaps only subconsciously. Was Les Genévriers, Eve's new home in Provence, based on or inspired by some place specific? Absolutely, yes. It is a fair description of the property my husband and I bought a few years ago, in a place we have known and loved for very many years. If anyone is curious to see photographs of it, they can take a look at my blog. Probably unsurprisingly, I like to read! Reading is one of my favourite pastimes in the world, and without at least one book on the go I feel bereft. I like painting, and walking in the countryside and being by the sea. In case that makes me sound too solitary, I also love chatting and hanging out with friends. Unlike Eve and Dom’s situation, our house in the south of France is often full of people having a good time! Lots! I’ve really enjoyed Jennifer Egan’s A Visit from the Goon Squad. Margaret Drabble’s The Seven Sisters is a clever, fun read with lovely writing and an underlying seriousness. I was so enraptured by Paula McLain’s The Paris Wife, inspired by Hemingway’s first wife Hadley that it sent me on a lovely book trail beginning with Hemingway’s autobiographical A Moveable Feast. Nothing like a lovely book trail where one leads on to another and then to another…! My thanks to Ms. Lawrenson for her time! To learn more about her book, check out her website and Facebook. For more reviews, see the other books on the blog tour. I'm thrilled to offer a copy of The Lantern to one reader. To enter, simply comment on this entry with an email address. Open to US/CA readers, ends 9/2. For another entry, comment on my review. Great interview- I read The Lantern recently and I really enjoyed it. I want in on this! Ever since the cover popped up here this has been on my radar. And reminded me I need to read A Visit from the Goon Squad! I would love to read this book, also--great interview! This sounds amazing!! I would love to win a copy and dive into it!! I just finished The Lantern yesterday, and have to say that it was a pretty incredible read. I loved getting a peek into the author's brain over here today, and have to agree with some of her choices for great reads! Thanks for sharing this with us! Great interview! I always like to hear about what authors are reading. I really enjoyed this book too and am looking forward to whatever she writes next. (No need to enter me)! thx Audra - always happy to meet the author! The photos on the authors blog look amazing! Very nice! I have The Lantern in my TBR pile and can't wait to read it! Like Heather, I love getting insight into what the author is like. Thanks so much for posting this interview! I really enjoyed this q&a. I haven't heard of this one before, it sounds great! Wonderful interview. This novel sounds fantastic. Thanks for another chance at this giveaway. Thanks for sharing the great interview and giveaway with us! Great interview--I've been dying to read The Lantern! Just checked out her house...nice! I love that her favorite hobby is to read! Thanks for another great interview. The description of Lantern just sounds so interesting. I would love to read this. I have already suggested this book to my book club. This book has been on my "to read" list for weeks now! Would LOVE to win a copy! I'd love to read this book! Please enter me in the draw! The interview was great, but I loved your opening sentence! "I fell into hot, heavy, passionate love with Deborah Lawrenson's novel The Lantern." How could anyone resist the book after THAT sentence?! well that's quite an endorsement! no need to enter me in the giveaway but i really enjoyed this interview! I LOVED reading this post/interview. I've been wanting to read this one. This review makes me want to read this book. I'd love to win.